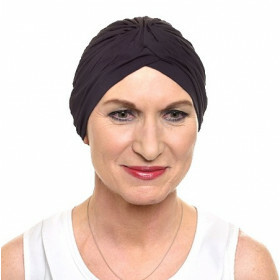 Taupe BARBARA turban : our favorite, which will make you both original and elegant! Taupe BARBARA turban : our favourite! Taupe pleated turban which will easily merge with your wardrobe. Mainly made out of bamboo, it will offer you softness and extra comfort. You will love the pleats which give the turban a subtle touch of elegance. Perfect to replace a wig inside or outside your house.